"Captain Starr Of Space - Queen Nilo Incident"
This interesting and enjoyable collection features rare old time radio shows about captains that guide ships, rockets, and bands. Join Captain Stubby, Danger, Courage, and Starr as they play the washboard, battle the sea, and avoid asteroids with ease. Grab your swash bucket and hit the deck with Captain Courage, an American sailing captain who packs his ship with stories of suspense, mystery and romance! Or perhaps you would like to sail with Captain Danger, who sails right into the laps of sinister island savages, dark forbidding lands with throbbing jungle drums, and lands of mystery and intrigue! If space helmets are more your style, you'll enjoy Captain Starr, who comes from the future and will shoot you into space with his thrilling galactic adventures. If you feel more like tapping your peg leg than tramping it across the boat deck, you'll love Captain Stubby and his Buccaneers, who plays music so sweet your tooth will ache. Captain Stubby, whose real name was Tom, was discovered by George Briggar (who also discovered Gene Autry). 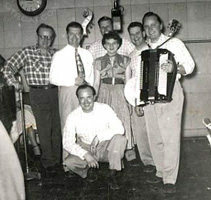 After this show, he later went on to play on the old time radio show, National Barn Dance. Whatever your fancy, whether its music, adventure, the high seas, or the high skies, this Rare Captain Collection will strike it. So grab your ray gun, eye patch, and accordion, because it's time to meet the Captains! Ei-ei. Be the first to comment on "Rare Captain"